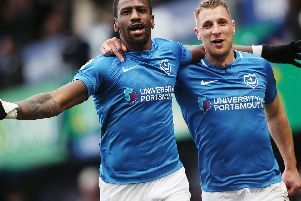 David Wheeler will be a big player in Pompey’s push for League One promotion. That is the verdict of Blues boss Kenny Jackett. Wheeler completed a loan switch from Championship side Queens Park Rangers in August but has made just two starts – coming in the Carabao Cup and Checkatrade Trophy – since his arrival. The impressive early season form of wide pair Jamal Lowe and Ronan Curtis have kept the 28-year-old out of the team. However, Wheeler was thrown on as a second half substitute in the 4-0 FA Cup win over Maidenhead United – getting just his second goal for the club following his introduction. On the back of that, the attacker could feature from the outset when Pompey welcome Tottenham Hotspur in the Checkatrade Trophy tomorrow. And manager Jackett feels he can call on the player from the start should he wish to do so as the season progresses. He said: ‘He's a good player David who is pushing for a starting position, I'm pleased he's here with us. 'David is comfortable in any of the front three positions and we have flexibility in our system and where he can play. 'In terms of between now and January and the end of the season, David is going to be a big player for us. 'He played very well again when he came on. ‘David is a very good player and close to my thoughts.